During the late 1970's and early 1980's, various commodity prices hit record high levels yet the misinformed myth of the Hunt Brothers cornering silver somehow remains a repeated scapegoat. 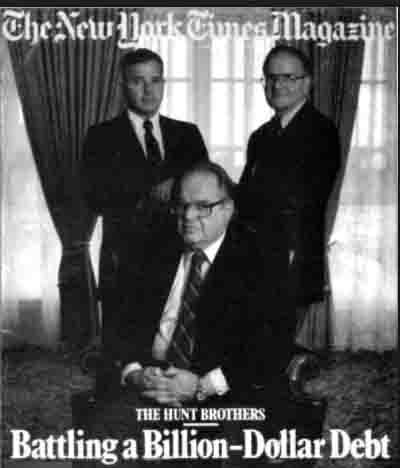 Who are the Hunt Brothers? Often when supposed financial market experts want to discuss inflationary pressure from the 1970's and early 1980's they drag out the Hunt Brothers scapegoat as an example. Their mantra goes something like, ‘three billionaire Texans bought all of the silver in the world and therefore caused an otherwise unexplainable $50 oz USD silver price in January 1980’. This following 1980 bullion bull market price chart contains the world’s fluctuating spot prices for gold, platinum, and silver starting in 1970 all the way to 1984. Palladium spot pricing begins in 1977 and also extends to the beginning of 1984 on the following chart. 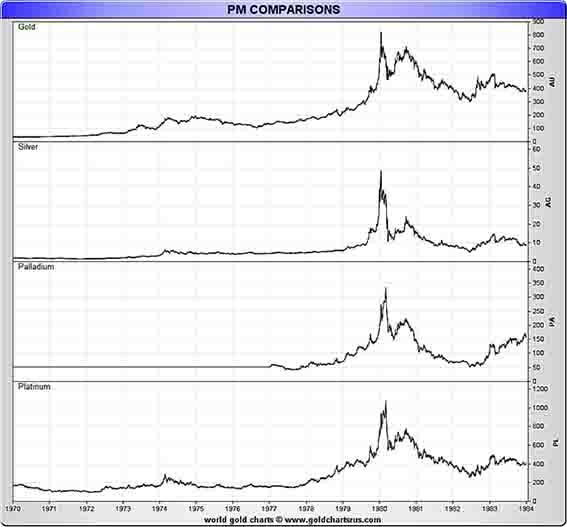 Notice how all 4 precious metals hit their then record high prices within months of one another (winter / spring 1980). As we have covered, President Nixon unexpectedly closed the Bretton Woods agreement and the US dollar’s final ties to gold on August 15, 1971. It was this action and prior decade’s deficit spending by the US government which helped set forth inflationary episodes that brought all 4 precious metals to their then respective ‘all time price highs’ in the first half of 1980. In the early 1970's the USA also had two various somewhat severe overnight US dollar devaluations. The first quickly followed the aforementioned Nixon Shock and whereby December 1971 we had agreed to a resultant 11% US dollar devaluation. By early 1973, the US dollar had to again be devalued overnight by 10% (coincidentally we just had another 10% devaluation of the US dollar in 2017 alone). Back then the US dollar’s value volatility helped both silver, gold, and platinum markets to hit interim bull market highs by 1974 which were followed by multiple years of price consolidations (e.g. bear traps). Added to the US dollar’s inflationary pressures was the start of two 1970's Oil Crisis events. In October 1973 the Organization of Arab Petroleum Exporting Countries’ (OPAEC) embargo of oil exports to the United States would have repercussions throughout the remainder of the decade and into the 1980's. 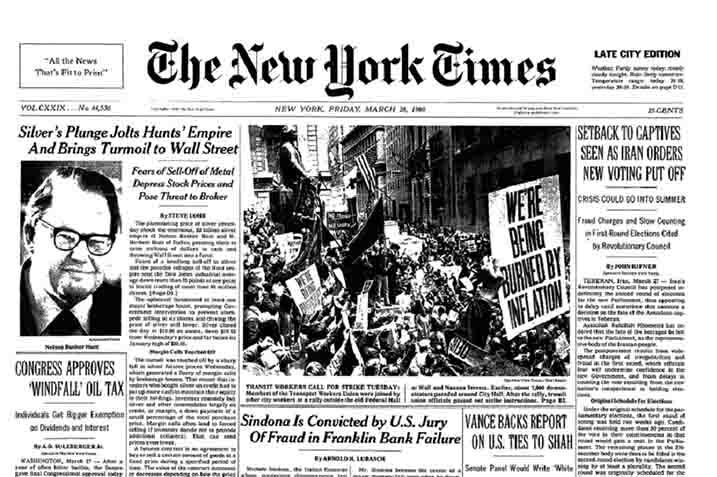 Also in 1979, events in the nation of Iran caused the beginning of the second oil shock which led again to gasoline shortages and panicked long consumer lines at gas stations in the USA. From 1978 into 1980 the world witnessed a US dollar quadrupling of crude oil prices, a quintupling of platinum prices, a six-folding of palladium prices, and a gold price spike from $200 USD oz in early 1978 to a then record high of $850 oz by January 21, 1980. During this same timeframe silver went from about $5 USD oz to as high as $50 oz on January 21, 1980. The ongoing confusion as to what contributed most to this silver price increase is what we will examine next. It was not the Hunt Brothers who almost imploded the US dollar’s value. How’d the Hunt Brothers corner the silver market? The myth that a few billionaire brothers from Texas cornered and drove the price of silver to come $50 oz in 1980 still exists to this very day. It is a misconception or twist of the truth at best, and at worst a solid framing with public tar and feathers to follow for decades. These guys were not shrewd businessmen, they were more akin to trust funders who had warranted fears, and thus took heavy bets with capital their dad created. Estimates are some 12 billion ounces of silver existed above ground in 1980 (the figure excludes rare coins, jewelry, and antiquities). At their peak of buying, the Hunt Brothers controlled about 250 million ounces of combined silver bullion (100 million oz) and silver futures contracts (representing some 150 million ounces). This total represented about 2% of the then world’s physical silver supply. Their physical silver bullion position then was smaller than Warren Buffet’s was from 1998 - 2006. Somehow the fallacy still persists that three wealthy brothers from Texas cornered and drove the price of silver into a bubble in early 1980 which ultimately led to $1 USD billion bailout by the Federal Reserve and other commercial banks. While the Hunts made a contribution to the $50 USD oz silver price spike on January 21, 1980 the critical question is by how much was silver’s price rise contributable to their actions alone. Bullion market expert and someone who worked directly in the silver bullion market back then, Jeffrey Christian, is purported to believe that a mere 75¢ or $1 USD oz was added by Hunt brother actions to the 1980 record silver price of near $50 oz. Other economic studies suggest perhaps the Hunt Brothers were simply scapegoated in court and through public opinion campaigns. 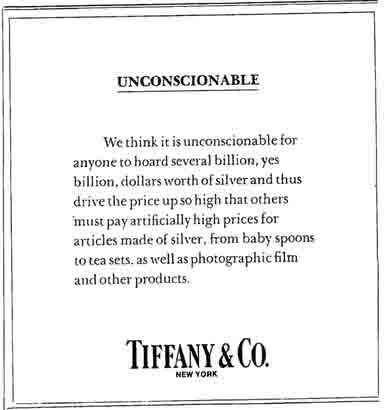 Even famed silver jewelry company, Tiffany & Co., got in on the act without naming names. Somehow too, most modern financial journalists often fail to mention that while the prices of silver and gold were hitting record highs on Friday January 18th 1980, the COMEX sprung out the following Monday with drastic rule changes to “liquidation orders only” for silver futures. This essentially meant silver futures traders could not longer go long silver (bet silver’s price was going higher). These unprecedented actions obviously helped lead to the eventual collapse in silver futures prices. This temporary silver futures contract rule change also likely spooked gold futures traders as well, turning them bearish given this temporary ‘sell silver only’ intervention. On Monday January 21st 1980, gold hit a then record high $850 oz USD price in the afternoon London PM fix. What followed only a few months later were also then record high prices hit for platinum and palladium respectively. The Hunts Brothers losses were so vast that it nearly froze and crashed the financial system. The Federal Reserve had to line up a $1 billion bailout amongst a consortium of banks. The Hunt Brothers were eventually put on trial accused of market manipulation, lost, and were saddled with a billion dollar debt (at very high interest rates) to go along with multi decade public legacy humiliations that would follow. Yet these Hunt Brothers silver buying and silver futures contract leveraging efforts in the 1970's do not explain the various price multiples in many other highly traded commodity and precious metal future contracts during this similar small time frame (e.g. oil, gold, platinum, and palladium). We can certainly doubt Randolph & Mortimer Duke were cornering any other aforementioned commodity futures markets at the time. In reality, rampant inflation and real world concerns about US dollar viability were strongly afoot in the 1970's and early 1980's. 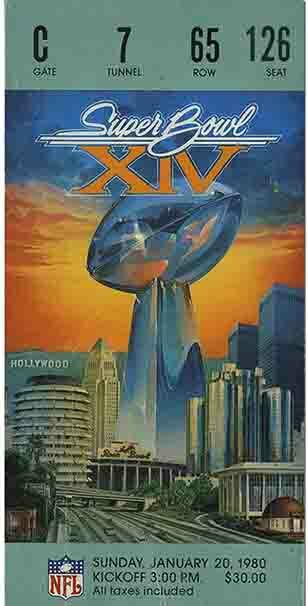 Of course Hollywood found other ways to dramatize this as these concerns were obviously very palpable back then. These late 1970s early 1980 commodity and precious metal price spikes were brought about through a mixture of greed, fear, ongoing wars, oil embargoes, political instability, and high inflationary pressures ongoing with US dollars, other fiat currencies, and the macroeconomy at the time. The US government had to go so far as issuing its very own bonds in two foreign fiat currencies in 1978 ( see Carter bonds 1 / 2 ). In the same year that all 4 precious metal prices recorded new all time highs, the then 12th Chairman of the Federal Reserve, Paul Volcker, achieved a record Fed Prime Rate of 21.5% by December 1980. This ultimately attracted huge capital inflows into the US financial system as high price inflation was eventually stamped down with resurgent US dollar strength in the middle 1980's (up to and until the 1985 Plaza Accord and its US dollar devaluation agreement). The U.S and Saudi Arabia’s 1974 Petrodollar system agreement and subsequent flooding of the world with US dollar denominated debt issuances (this now more than 25 yr bond market rally possibly ending soon), helped garner in an era of financialization the world has never seen before. 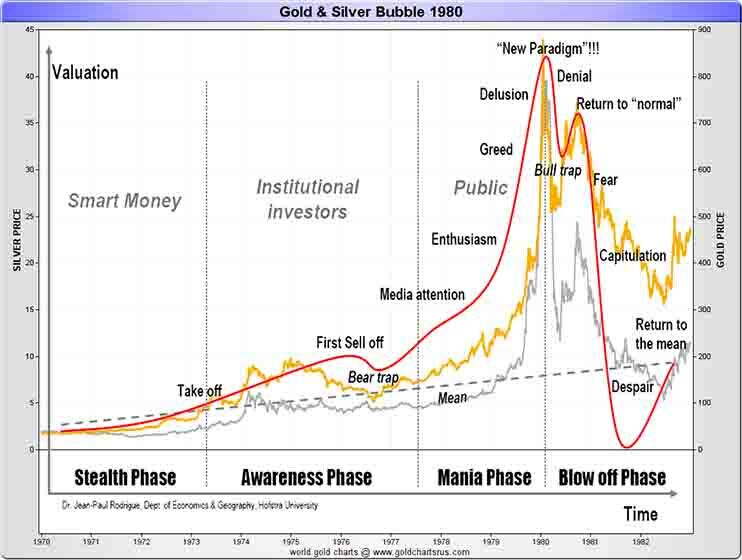 Precious metals subsequently suffered a near 20 year secular bear market that lasted into the beginning of this current secular bull market and ongoing 21st Century Gold Rush.